Today is the All Ireland Senior Football championship where Mayo will play against Dublin for the title of All Ireland Champions and trophy know as the Sam Maguire. You might be thinking what connection has this event to do with archaeology but the trophy presented to the winners of todays match was inspired by one of Ireland’s most treasured artefacts the Ardagh Chalice. Most Irish people know a little or have at least heard of the Ardagh Chalice. For those of you who havent it is a stunning two-handled chalice discovered in the nineteenth century near the village of Ardagh Co Limerick. The chalice is what is known as a calyx ministerialis and was used to dispense Eucharistic wine to the congregation during the mass. The chalice is small, only 17.8 cm in height and 19.5cm in diameter, excluding the handles. It has a complex design made up of 50 different parts. The National Museum website has a detailed description of how the chalice was made. The bowl and foot are made of beaten, lathe-polished silver, the stem is cast gilt-copper alloy. It is decorated with gold filigree, granulation, multi-coloured enamels, a large rock-crystal, amber, malachite, knitted cast, stamped and openwork metal objects. A girdle of ten filigree panels of animal ornament and interlace encircles the bowl between the elaborate handles. Below it, incised on a dotted background are the names of the apostles in an elegant script familiar from contemporary manuscripts. Animals and a design of human heads, lightly engraved, spring from the lower border of the inscription below the handles and medallions. The medallions, one on each side, in the centre of the bowl, are cast bronze frames in the form of a cross of arcs within a circle, embellished with gold filigree scrolls, simple coiled serpents in beaded wire on gold foil and enamels. The stem is elaborately decorated with La Tène designs, animal ornament, fret patterns and a honeycomb-like interlace in cast gilt-copper alloy. The foot of the chalice is large and is decorated on both the under and the upper surfaces. A great roundel of cast ornament, filigree beasts and a rock crystal with a surround of amber glued with a malachite paste, decorate the interior of the foot and conceal the end of the large pin which holds bowl, stem and foot together. Where did the Ardagh Chalice come from and how was it found? The story of how the chalice was discovered is as fascinating as how it was made. The Ardagh Chalice was found as part of a hoard of artefacts that included a bronze chalice and four gilt-silver brooches ranging in date from the eight to the tenth century A.D. The hoard, was discovered in 1868 in a ringfort ( an enclosed early medieval settlement) at Reerasta Rath near the village of Ardagh, Co. Limerick. Its thought by some that the hoard was concealed here during the tenth century A.D. Looking north from the interior of Reerasta Ringfort, with the ‘Black Hill’ Hillfort in the background. The hoard is thought to have been discovered in the western part of the fort taken Know Thy Place website.. It was discovered in September 1868 by two men digging potatoes in a ring fort at Reerasta, Ardagh. They were Jimmy Quin and Paddy Flanagan….. The Sisters of Mercy owned the land and Mrs. Quin rented about 15 – 20 acres from the nuns. Jimmy was her son and Mr Flanagan was a workman employed at the time by the Quin family. It has been suggested that it was he who actually found the chalice but that Quin took all the glory. He felt aggrieved by the situation and felt obliged to leave the employment of the Quin’s. On his death he was buried in the Paupers’ graveyard in Newcastlewest. The other man, Quin, later emigrated to Australia where he died. Mrs Quin sold the items to the Bishop of Limerick, Dr. Butler, at the time for £50.00. Dr. Butler in turn sold the chalice to the Royal Irish Academy for £500….. The chalice itself was one of a number of objects found at the time. There was also a smaller bronze chalice as well as four ornate brooches, which collectively became known as the ‘Ardagh Hoard’. According to tradition, mass used to be said in the Rath where the discovery was made, in the penal times. The chalice may have been used on these occasions to distribute communion to the multitude that assembled there. Perhaps when the alarm was raised to signify the approach of soldiers, and in the hurry of the moment, the chalice was hidden to prevent it from falling into the wrong hands. This would be supported by the condition in which the items were found, with neither case nor covering to protect them, suggesting that they were buried in a hurry. The person who placed them in the earth (Begley hinted that it might have been a Fr Bermingham, as he had to leave the area in a rush due to an alleged assault) may never have had an opportunity of returning to the place to retrieve them. Today the chalice is on display in the National Museum of Ireland Kildare Street but signage which bears its image and a memorial in stone in the village, show how it is still connected to the local memory in Ardagh. As noted at the start of this post, the Sam Maguire cup, the much coveted prize for the winners of the G.A.A. 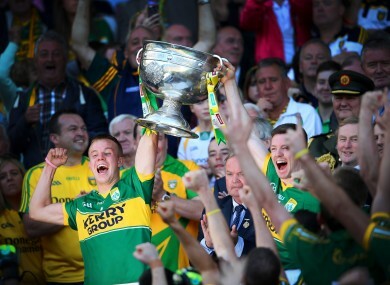 All-Ireland Senior Football Championship, is modelled on the Ardagh Chalice. ….. Hopkins and Hopkins, a jewellers and watchmakers of O’Connell Bridge, Dublin. The silver cup was crafted, on behalf of Hopkins and Hopkins, by the silversmith Matthew J. Staunton of D’Olier Street, Dublin……..
Kildare was the first county to win the “Sam Maguire Cup” in 1928 after defeating Cavan 2-6 to 2-5. The original trophy was retired in 1988 as it had received some damage over the years. The GAA commissioned a replica from Kilkenny-based silversmith Desmond A. Byrne and the replica is the trophy that has been used ever since. The best of luck to both teams today and the next time you are in Dublin pop into the National Museum and pay a visit to the Ardagh Chalice.